For all who are curious as to the mystery behind the SPOOs buying force, I refer you to a research report published by none other than Government Sachs, titled: “Equity issuance: $100 billion YTD; we expect another $200 billion.” Of course, ramping up futures does miracles for overpriced stock follow-ons (especially with GS as lead udnerwriter). 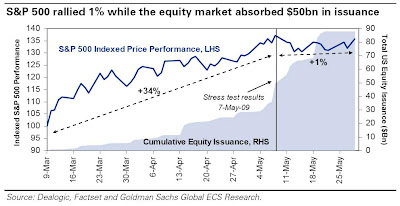 In other words, the 35% rise in S&P from the 666 bottom will likely see another 70% or so ramp up as all the equity is cleared under the guidance of the Goebbels Kommendant brigade. Following the last bear market, it took roughly 12 months to return to trailing, five-year average leverage levels. Leverage for non-Financial S&P 500 firms as measured by Assets/Equity (excluding Goodwill) rose to 4.4x at the start of May 2009. In order to return to leverage levels in line with the five-year average, another $200 billion in equity needs to be raised. See our Weak Balance Sheet basket (GSTHWBAL) for potential issuers. Translation: buy lots and lots of crap, crap, crap stocks. Especially buy the crappiest components of the GSTHWBAL index, as these are the ones where you will be seeing mysterious short recalls and 1,000% inexplicable intraday moves. The $60bn equity issuance by US Financials YTD has meaningfully plugged capital holes and better-positioned banks to absorb any future losses. Additional capital may be needed to repay TARP or make up for weak pre-provision earnings, but the bulk of issuance is behind us. Translation: if you doubt our efficiency in guaranteeing returns, see above. $3 trillion in money market fund assets and US mutual fund positioning has helped digest recent issuance and should support future deals.